This topic shows you how to use the Automatic Replies tab. Use automatic replies whenever you want to let people who send you email know that you won't be responding to their messages right away. After automatic replies are turned on, they'll be sent once to each sender. Open Outlook on the web and login to your account. At the top of the page, select Settings > Automatic replies. Note The setting is also located in the Outlook on the web options. 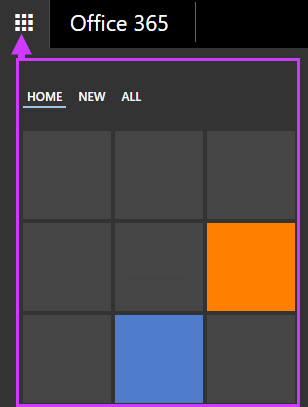 At the top of the page, select Settings > Options. Expand Mail | Automatic replies. Select this check box, and then enter a start time and end time to control when automatic replies are sent. If you don't set a time period, your automatic reply will remain on until you turn it off, and you'll be reminded you have automatic replies turned on each time you sign in to your mailbox. Use this box to create a message that will be sent only to senders who are inside your organization. This option may not be available. If you've selected Send replies to all external senders, enter the reply you want sent in this box. 1. Sign in to Office 365 at www.office.com/signin. 3. Choose Forwarding. If you don't see this option, it's not available for your account. 4. You can forward email to one other account. You can use inbox rules to automatically forward or redirect messages sent to your mailbox to another account. This is useful if you won’t be checking your primary mailbox and want to be able to read and respond to messages from another account. To set up inbox rules, go to Settings > Options > Organize email or Settings > Options > Mail > Automatic processing. This article is for Outlook Web App, which is used by organizations that manage email servers running Exchange Server. 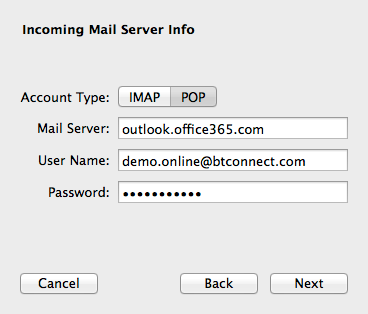 If you're using Office 365 or Exchange Server 2016, your email program is Outlook on the web. In a web browser, sign in to Outlook Web App. Enter your user name and password, and then click Sign in. Don't forget that once you've changed your password, your email client (such as Apple Mail or Microsoft Outlook, and your mobile phone) will need to be updated with your new password. If you also connect to your account from a phone or a tablet, you also need to update the password in the settings on that device to match your new password. Similarly, you also need to update the password in the settings of any other desktop email application you may be using (for example, Apple Mail or Mozilla Thunderbird). Use a minimum of eight characters (your account may require more or less). Use numbers as well as letters. Use punctuation or other non-alphanumeric characters. Most email accounts require a minimum number of characters or a minimum level of complexity for passwords. The requirements are set by your administrator. For information about the password requirements for your account, contact your helpdesk. 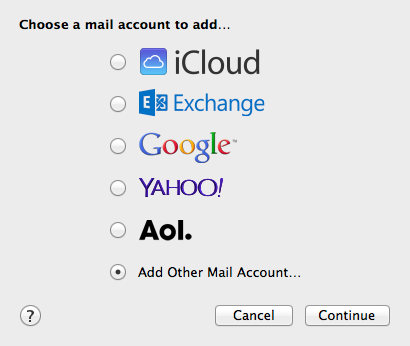 Depending on your mailbox settings, you may not be able change your password using the Options page. If you can't change your password using Options, contact your helpdesk. Self-service password change: The user knows their password but wants to change it to something new. Send a text message to a validated mobile phone. Make a phone call to a validated mobile or office phone. 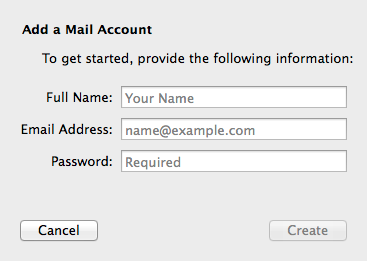 Send an email to a validated secondary email account. Self-service account unlock: The user is unable to sign in with their password and has been locked out. The user wants to unlock their account without administrator intervention by using their authentication methods. IMPORTANT: You must first register to use the SSPR service in order to use this feature. Please review the 'Register for self-service password reset' for instruction on how to do this (see related pages at the bottom of this article). If you forgot the password for the Microsoft account that you associated with Office, you can reset it at https://passwordreset.microsoftonline.com. As an end user, you can reset your password or unlock your account by yourself using the self-service password reset (SSPR). Before you can use this functionality, you have to register your authentication methods or confirm the predefined authentication methods that your administrator has populated. Open the web browser on your device and go to the password reset registration page. Enter your username and the password that your administrator provided. One or more of the following options are available for you to configure and verify. Office phone: Only your administrator can set this option. Authentication Phone: Set this option to another phone number that you have access to. An example is a cell phone that can receive a text or a call. Authentication Email: Set this option to an alternate email address that you can access without using the password you want to reset. Security Questions: Your administrator has approved this list of questions for you to answer. You can't use the same question or answer more than once. Provide and verify the information that your administrator requires. If more than one option is available, we suggest that you register multiple methods. This gives you flexibility when one of the methods isn't available. An example is when you're traveling and you're unable to access your office phone. Is your real email getting marked as spam in Office 365? Do this. Exchange Online Protection (EOP) attempts to filter out spam, keeping your Inbox clear of content that users don't want to see. But sometimes, EOP filters out things that you do want to see. 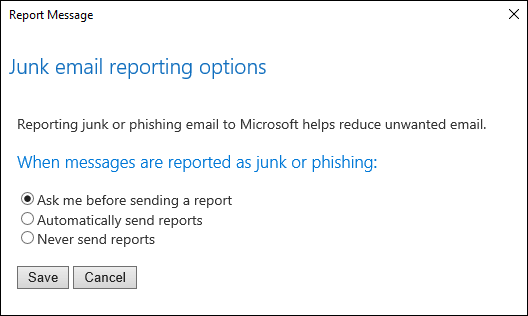 To remove messages, highlight the message, select not junk > and then report to Microsoft. To add an entry to Safe senders and recipients, enter the email address or domain that you want to mark as safe in the Enter a sender or domain here text box, and then press Enter or select the Addicon next to the text box. 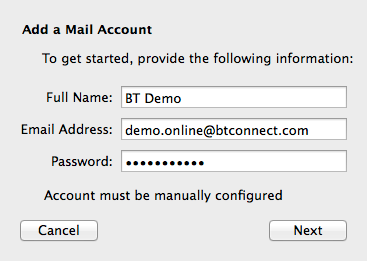 To change an entry in Blocked senders, select the entry and select Edit. 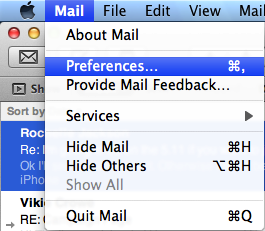 To set up email, first launch mail and then select Preferences from the Mail application menu. The below screen will then appear. Enter in your details and click the Create button. You should then get a screen similar to the below saying that the account will need to be manually configured. Click the Next button. The next page will be incoming server info. Check the mail server is the same as the below and your username is your full email address and click Next. The next page will be outgoing server info. Check the mail server is the same as the below and your username is your full email address and click Create. 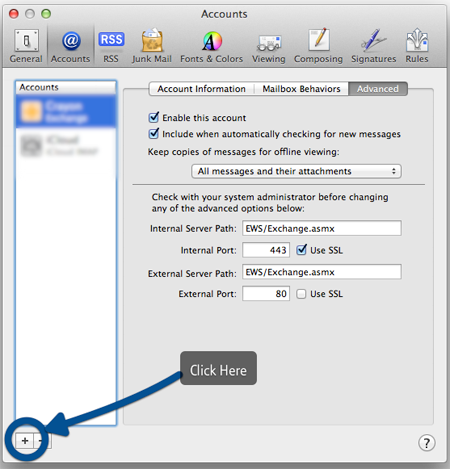 Your Mac Mail email account should now be setup and ready to use. Close the Preferences window and get started. Select account type as (other account). The account will now be checked and you'll be informed that the Account must be manually configured. Make sure the tab for POP is selected and replace pop3.btconnect.com with outlook.office365.com and click Next. 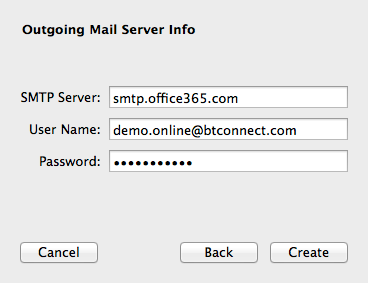 Replace smtp.btconnect.com with smtp.office365.com and click Create. Close the setting window and start using your account. (1) Go to your iPhone or iPad's Settings > scroll down and tap Accounts & Passwords > Add Account. (3) Enter your Office 365, Exchange, or Outlook.com email address and a description of your account. Tap Next. (4) Enter the password associated with your email account. Tap Sign in or Next. (5) The Mail app may request certain permissions. Tap Accept. (6) Choose the services you want to sync with your iOS device and tap Save. You're done! This article was last updated on January 3, 2018. For further support please contact CIT (UK) on 01530 272727.